I put a medicine chest which we haven't opened for about ten years, in order. Many kinds of old medicine were left in it, even ones which hadn't been opened yet. The price labels had become discolored with age, and some of the medicines weren't cheap. Oh, no! What a waste! 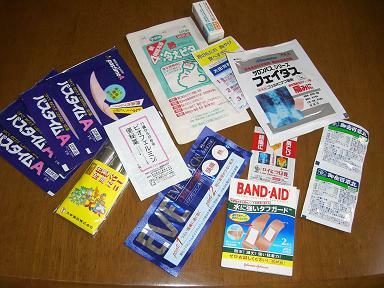 However, I threw them away, and then I found some free samples in a small drawer next to the medicine chest. Though the samples will never be used and are useless, I keep them as they are in the drawer.